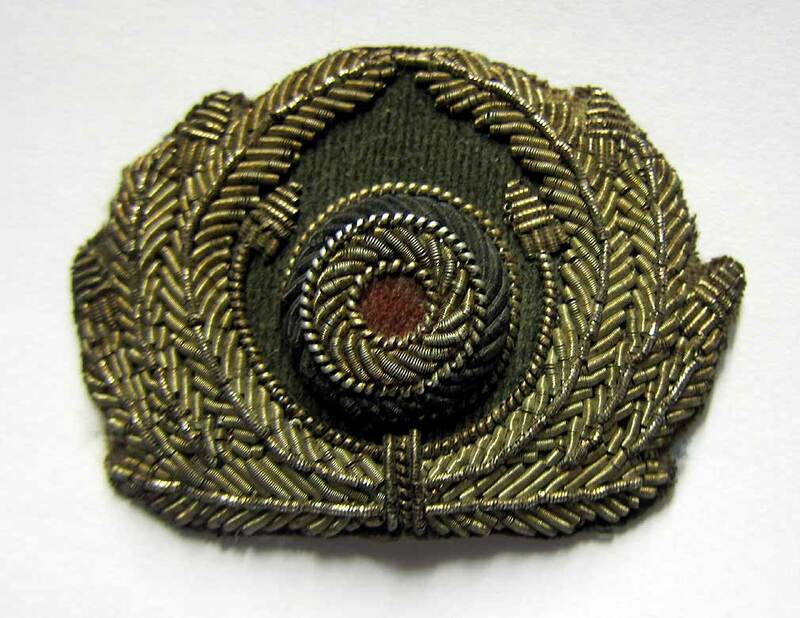 Many people do not realise that there was a huge abundance for privately purchased items such as uniforms & field gear but more especially caps, wreaths and badges. This was especially so amongst officers. 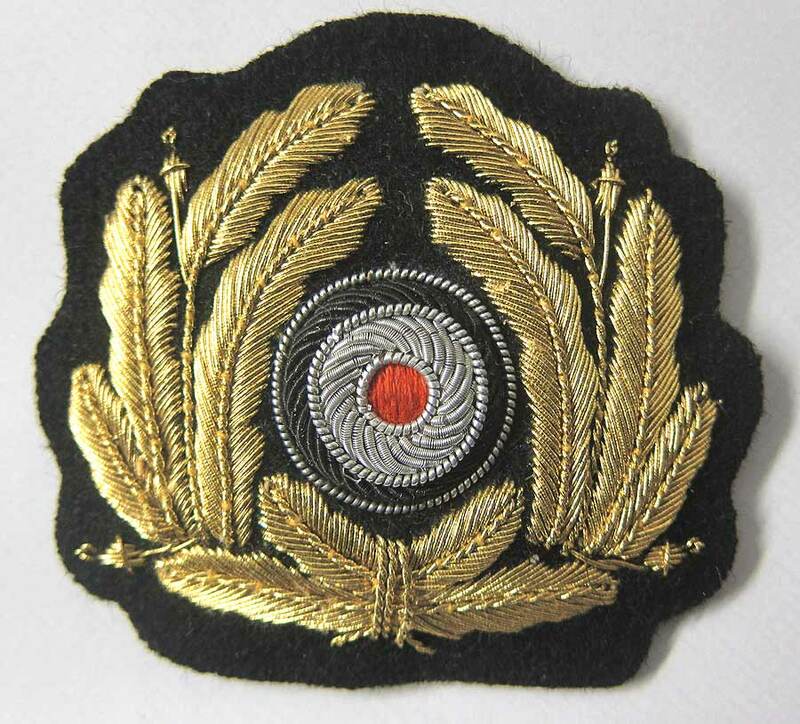 Our wreaths & badges have been modelled on, usually, private purchase examples and we offer them in new and aged condition. 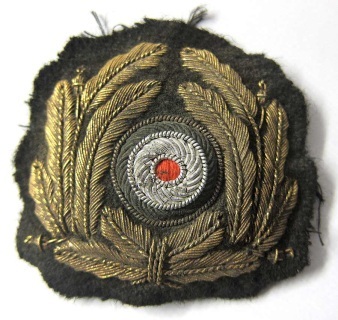 Our badges & wreaths are museum quality standard. Firstly they are of the correct thickness - yes our wreaths are not flat like so many other reproductions. Our wreaths & badges can be used for many things including replacing a missing or inferior wreath on your Luftwaffe, Heer or Kriegsmarine cap or to use as part of a collection of cap badges. Instructions on how to remove and replace a wreath can be found here. If you don't see a German cap wreath or Eagle suitable for your hat and want one made up, please email us the details. We may be able to make it for you. Please be aware we only make historically accurate helmet & hat parts. Reproduction Kriegsmarine (Navy), Eagle modelled on a commercial purchased example. Museum quality standard in gold bullion - 2mm thick x 64mm wide x 31mm tall and dark blue border of 2mm. Reproduction Kriegsmarine (Navy), Eagle modelled on a commercial purchased example. Museum quality standard in gold bullion - 2mm thick x 64mm wide x 31mm tall and dark blue border of 2mm. Aged to look 70+ years old. Reproduction Kriegsmarine (Navy), wreath modelled on a very early war private purchase example. Museum quality standard in gold bullion - 11mm thick x 60mm wide x 55mm tall. Reproduction Kriegsmarine (Navy), wreath modelled on a very early war private purchase example and aged. Museum quality standard in gold bullion - 11mm thick x 60mm wide x 55mm tall. There are worn areas, loose threads, darkened bullion etc. each wreath is unique by its ageing. 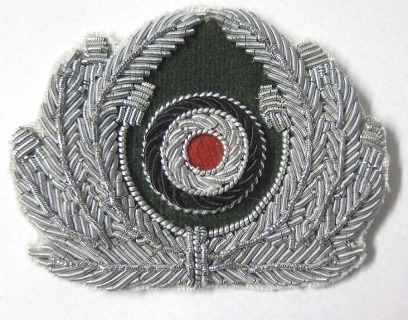 Reproduction Heer (Army), wreath modelled on a very early war private purchase example. Museum quality standard in aluminium bullion - 5mm thick x 56mm wide x 43mm tall. It is smaller than the 'standard' wreaths. This is the prefect wreath if you have an early war Whermacht Infantry cap with no wreath or if you are a re-enactor or collector who want to replace a poor quality wreath with something special. Notice the backing is white cotton - reproduced from the original the idea being that it would be trimmed right up to the aluminium bullion and then sewn/glued in place. 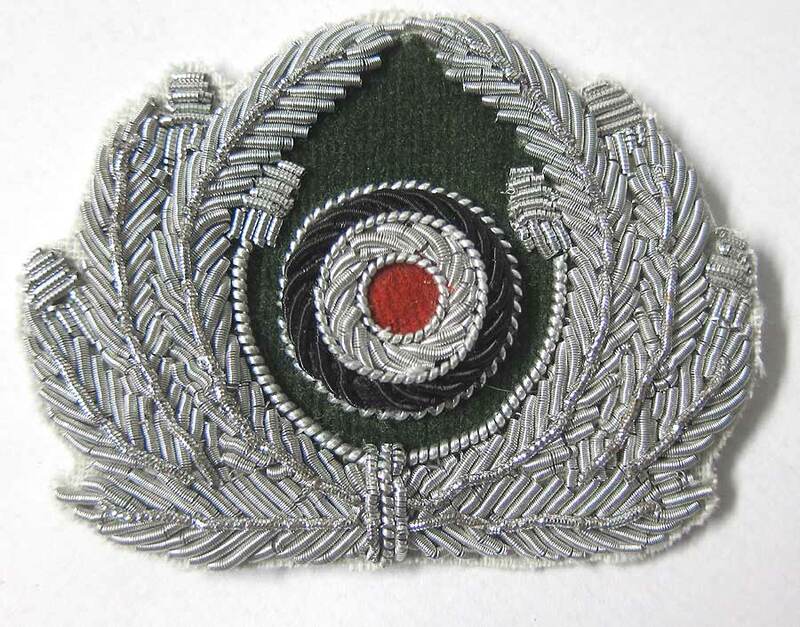 Reproduction & aged Heer (Army), wreath modelled on a very early war private purchase example. Museum quality standard in aluminium bullion - 5mm thick x 56mm wide x 43mm tall. It is smaller than the 'standard' wreaths. 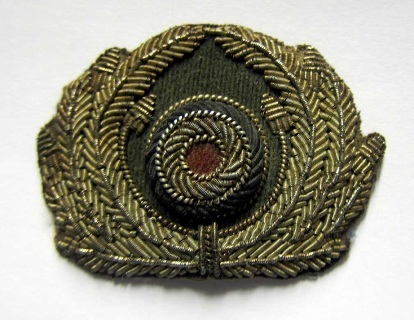 This is the prefect aged wreath if you have an early war Whermacht Infantry cap with no wreath or if you are a re-enactor or collector who want to replace a poor quality wreath with something special. Notice the backing is white cotton - reproduced from the original the idea being that it would be trimmed right up to the aluminium bullion and then sewn/glued in place. 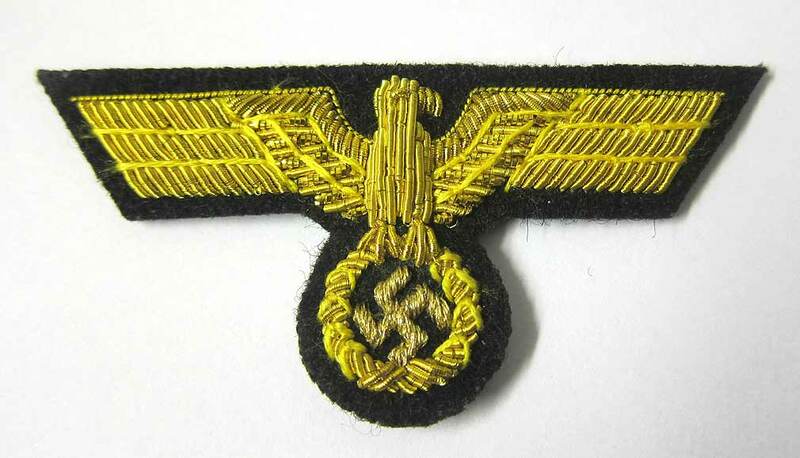 If you don't see a German cap wreath suitable for your hat and want one made up, please email us the details. We may be able to make it for you. Please be aware we only make historically accurate helmet & hat parts. 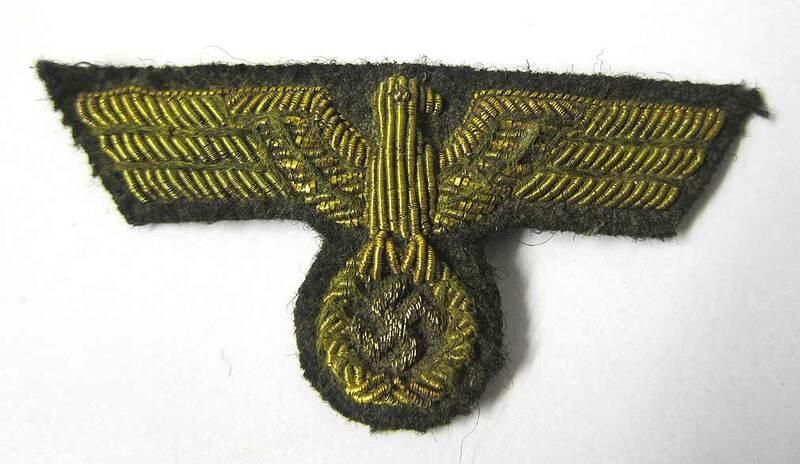 You can get to our metal German WW2 Badges here.